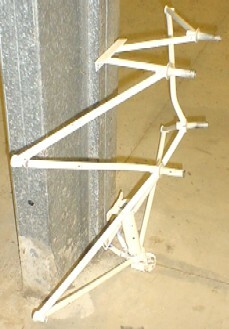 The BushCaddy had recorded 9.6 hours of test flight time without incident, however while performing circuits testing the most appropriate approach and landing speed, the aircraft landed heavily causing it to balloon touching down again before power was applied gaining altitude for another circuit. 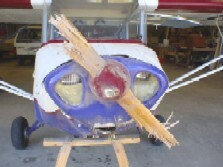 As the aircraft was slowing down for a full stop, the front wheel collapsed resulting in the nose contacting the ground causing the wooden propeller to shatter and considerable damage to the metal cowls but the airframe was not damaged. The pilot was not injured in the incident. 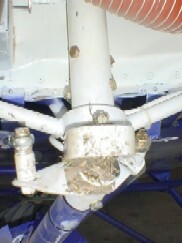 The front wheel assembly is designed to collapse in stages and one can see from the picture on the right the two support chrome molly tubes have bent on impact and even with the total weight on the front wheel, no damage was caused to the undercarriage. 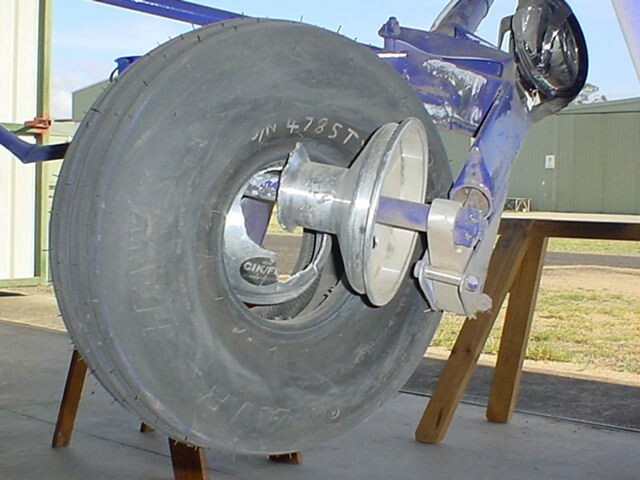 While the wheel fork, pistons, polyurethane spring and bolt that holds the wheel in place was not damaged in the incident, of concern is the shattered hub that allowed the tyre and tube to separate resulting in the fork digging into the grass and dirt on the side of the runway. 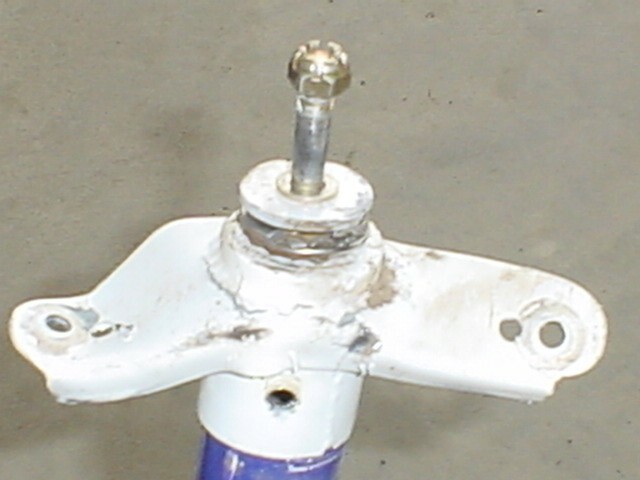 The AN5 bolt holding the wheel fork to the mounting bracket was in tact and prevented the whole assembly from separating which would have resulted in considerably more damage. 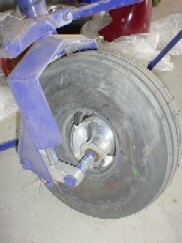 The compression bearing broke in several places and the steering arm and push rods were also damaged. 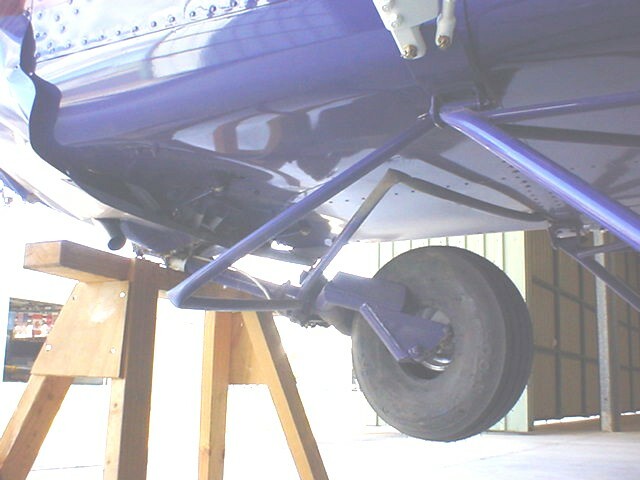 Due to the way in which the front wheel mount was fabricated into the engine mounting frame, as the wheel assembly bent under the undercarriage, the pivot motion caused the frame to develop a twist in the lower section. 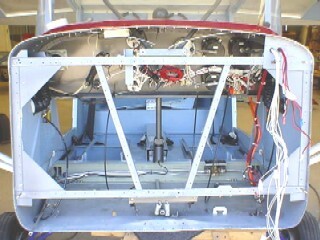 A small amount of damage was caused to the front edge of the floor pan, however the whole front section will be modified so the front wheel attachment point will be separate to the engine frame.